The Blue Checkerboard (Clear With Blue Buttons) Keyboard Cover from KB Covers is a durable, ultra-thin silicone overlay for your MacBook, MacBook Air or MacBook Pro. The cover features the standard QWERTY keyboard symbols printed on clear silicone with buttons. Additionally, the see-through caps lock light makes it easy to tell when it's on. While allowing for comfortable typing, the cover protects your keyboard against dirt and debris that can harm the keyboard. Additionally it can be washed by hand, making it very easy to keep clean. 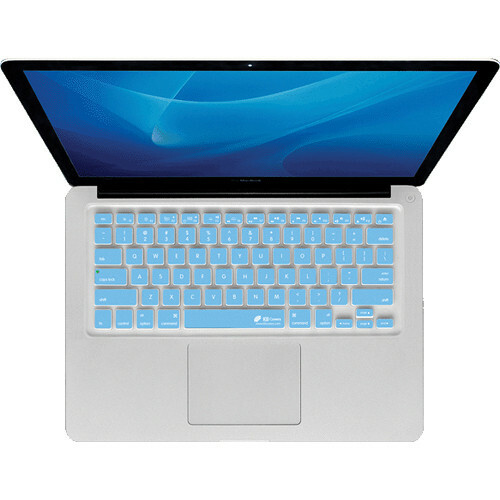 Box Dimensions (LxWxH) 11.6 x 5.0 x 0.2"
Blue Checkerboard (Clear With Blue Buttons) Keyboard Cover is rated 4.1 out of 5 by 8. Rated 3 out of 5 by Jayman from Works Great I had someone spill a drink onto and into my laptop about a month ago so I bought this product to protect my replacement computer. This protector has helped in keeping my new laptop protected, so far. Rated 4 out of 5 by Gaetan from I will buy this product again when worn The skin is very thin and doesn't influence the keyboard at all. Very good dust and spill protection. Rated 5 out of 5 by RickK from Perfect fit, stays on and protects Fits perfectly. Looks great and protects keyboard. Rated 3 out of 5 by Cop Trang from Cute but, thats all it got Flexible material, which is good.I like pink, it got pink, which is good.But only after 1 week of use, it start to scraped off little by little. i which it was a liltle more durable.Beside that, its an ok buy. Rated 5 out of 5 by Alberto Llauger from A product for the ones that save money I love how this checkerboard looks on my Mac it just fits my need. Rated 5 out of 5 by PHiLDOGGiE DOGZ from Nice!! helps protect my keys from my kids!!! Will this work on a MacBook Pro 13&quot; A1502 model?